Email Just Can't Compete With Heartfelt 'Letters Of Note' The art of letter writing is also an act of preserving history. The correspondences gathered in the book Letters Of Note tell stories of delight, hope and loss — and the nature of human connection. Perhaps it's a sense of intimacy brought on by the physicality of the paper, the added weight of words presented in ink. Whatever it is, receiving a personally addressed letter in the mail — especially in today's digital age — can be undeniably affecting. Editor and blogger Shaun Usher is a collector of written correspondences that he finds in archives, attics and libraries. 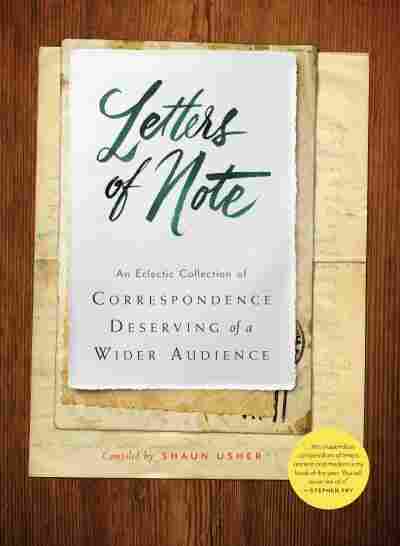 He's compiled his findings in a blog turned book called Letters of Note: An Eclectic Collection of Correspondence Deserving of a Wider Audience. The letters range from funny to sweet to tragic, and have been sent or received both by well-known figures and by everyday folks. For a weeklong series on the art of letter writing, NPR's Audie Cornish spoke with Usher and several of the subjects found in his book about their experiences with the exchange of words on paper. In 1934, Robert Pirosh, an aspiring screenwriter, addressed a creatively written job application letter to numerous film studios and producers in hopes of landing his dream job. To prove his wit, Pirosh used his letter to profess his love for words. He opened with, "Dear Sir, I like words. I like fat, buttery words," and went on to list nouns, verbs and adjectives rich with connotation. Pirosh did land a job, and turned out to be quite successful, eventually winning an Oscar. "That's my current favorite" letter, Usher says. "I think it's just completely perfect." In 1989, then-7-year-old Amy Corcoran sent her favorite author, Roald Dahl, her interpretation of a "dream in a bottle" — a reference to Dahl's popular book The BFG. To her surprise and delight, the children's author wrote back a short but sweet thank you letter. "We used a knife to open it properly, so the envelope's still intact," Amy recalls. "I was just over the moon to receive a letter from Roald Dahl." None of her classmates at school at the time actually believed her, she says — but there's now published evidence of the correspondence. 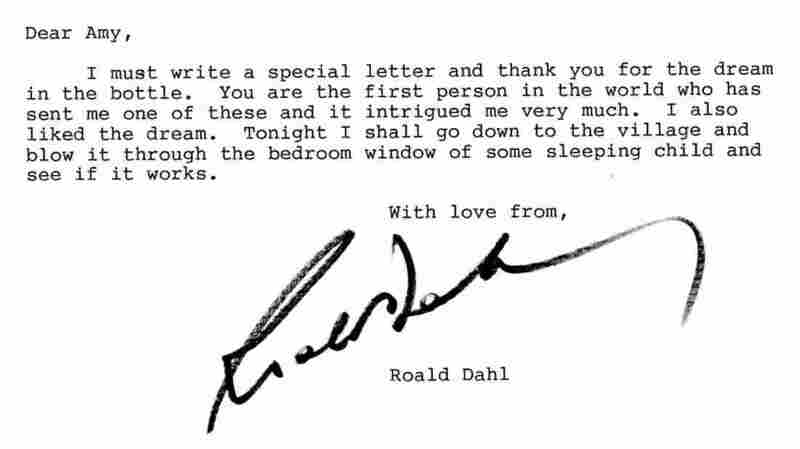 Author of James and the Giant Peach and Matilda, Roald Dahl showed his sense of humor and whimsy in his letter to a young Amy Corcoran. Bill Baxley, who served as Alabama's attorney general between 1971 and 1979, is well-known for reopening the investigation of the 16th Street Baptist Church bombing, a hate crime that killed four African-American girls in Birmingham in 1963. Baxley's efforts, which ultimately led to a conviction, attracted the ire of white supremacists — including Edward Fields, the "grand dragon" of The New Order of Knights of the Ku Klux Klan. 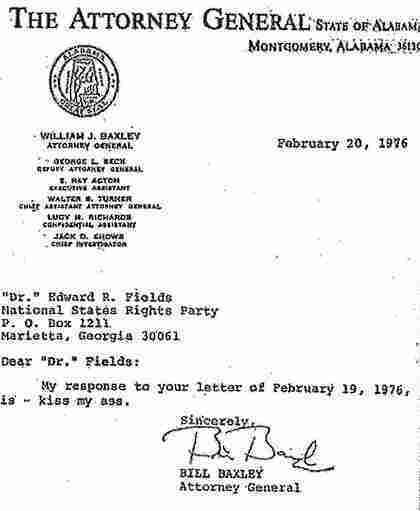 In response to a threatening letter from Fields, Baxley famously sent a curt response containing some colorful language. He'd rather not read the line aloud today, he says, but adds, "well, that's the way I felt, then and now." Frank Ciulla lost his father, S. Frank Ciulla, in the 1988 bombing of Pan Am Flight 103 over Lockerbie, Scotland. 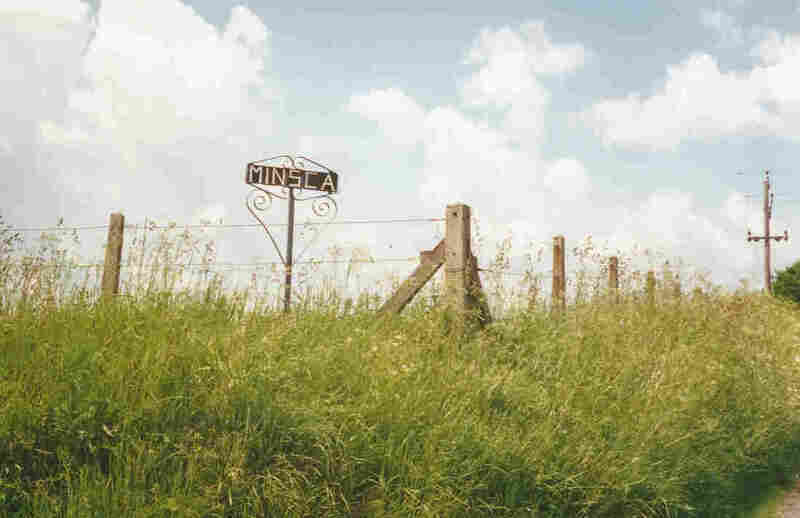 His body was found several miles from the crash on a farm owned by Margaret and Hugh Connell, which the Ciulla family visited in 1992. "It was a strange mix of feeling such love and warmth from the Connells and finding out the details of how my father was found," Frank Ciulla remembers. "It was an odd, odd time, as much of our time since then has been." Several months after their visit, the Ciullas received a letter from the Connells expressing their affection for the family. Much of it reads like a poem: "It's the 'not knowing' that can bring so much pain and bewilderment. We all have imaginations that can run riot in us, and I'm sure that your dear souls must have had untold agonies wondering and worrying." Though the letter is still difficult for Frank to read, it's the "rawness of emotion" from the Connells, he says, that stays with him today. Frank Ciulla's father died in the Lockerbie bombing in 1988. Cuilla visited Minsca, the farm where his father's body was found, four years later.